I had been craving a Barleywine all day and was very glad that I had put my bottle of Old Guardian into the fridge the night before. I cracked it open as I was grilling turkey burgers and poured the ice tea colored liquid into my Stone Old Guardian glass. The head is a mild ring of off white with minor carbonation. Dirty film floats atop the liquid, leaving behind a mild amount of lacing. I was actually surprised by the amount of lacing, considering how tame the head and carbonation was. Maybe I was influenced by the color of this beer, but I picked up some ice tea notes in the forefront of the nose. Brown sugar and molasses showed up quickly after, with some whiskey hiding down below. A touch of non-edible scents like leather and sawdust were also picked up. Burnt sugar and alcohol hit my palate right out of the gate. A touch of flat cola shows up in the middle, before it’s overshadowed by some sweet molasses notes. I was expecting a typical Stone hop bomb, but ended up being surprised by how sweet this beer actually was. Mouthfeel is light-to-medium, but wicked sticky. Tons of residue is left all over my gums and teeth after each sip. 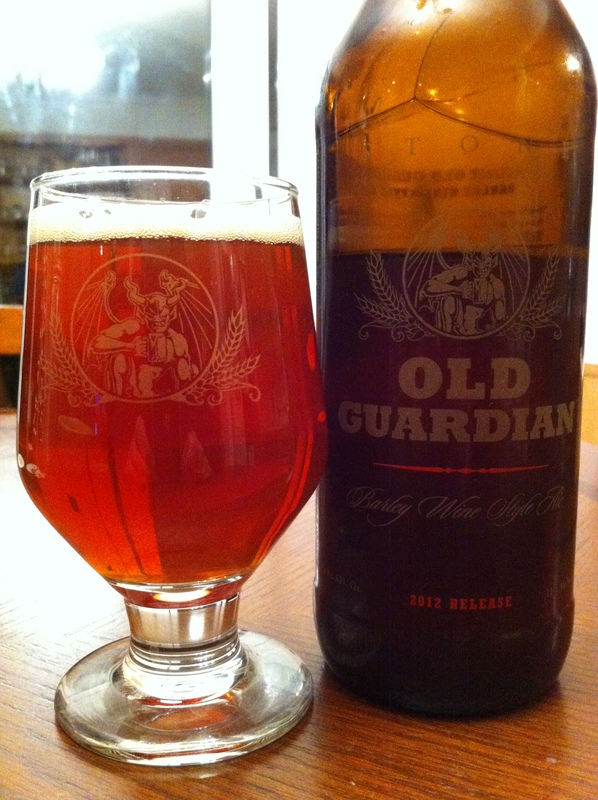 Old Guardian is a beer made for holding on to. I’ve had this bottle for eight months and it’s still quite “hot”. Stone is known for going big with their beers and this one doesn’t disappoint in the least. 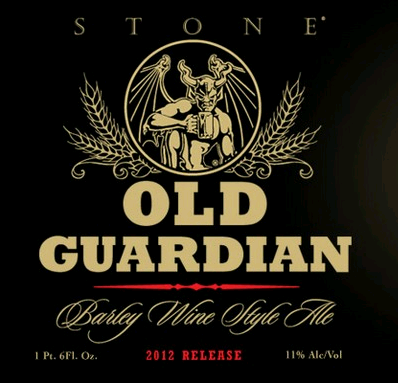 Not as balanced as some of its counterparts, but what do expect when you see that gargoyle on the bottle?